A genre system divides artworks according to depicted themes and objects. Abstract genre, in a narrow sense, has neither theme nor object. Abstract was not a part of classical hierarchy of genres that had developed in European culture by the 17th century. It ranked genres in high – history painting and portrait, - and law – genre painting, landscape and still life. As a separate genre, abstract painting appeared in the early 20th century – though actually it had originated alongside with figurative painting. Paleolithic rock art in Chauvet Cave was created about 36 thousands years ago, and there, images of rhinos and bison coexist with abstract lines and dots that cover vaults of the cave. In Celtic art, which flourished in the 10th–5th century BC, the ornaments of entirely abstract motifs (like knots and spirals) were extremely popular. Since the 7th century the spread of Islam (and its theological ban on human depiction) initiated active development of calligraphy, accompanied by floral or purely geometrical ornaments. In the middle of the 19th century, with the advent of photography, realistic art exhausted its potential. Just at this time, the romanticist William Turner created marinas, where the object is almost not discernible in monochrome shades of color. This trend was resumed by the impressionist Claude Monet: in the 20th century he painted nearly abstract works from the series "Water Lilies", where the object was all but dissolved in light and color. In Analytical Cubism of Picasso and Braque, the object “falled apart” into separate facets; still-lives of this kind adjoined to pure abstraction as well. But only Abstract Art, in the 20th century, entirely rejected the realism, deliberately abandoning the mimetic (imitative) approach to art. The painting moved from creating the illusion of the depth (perspective) to emphasizing the flatness of the canvas. The image designedly became non-figurative, unrepresentative, built on combination of colors and abstract forms. In the early 20th century this trend was implemented in two main courses. The first one was manifested in biomorphic (organic) abstractions of Kandinsky, and later developed in surrealist abstractions of Joan Miro and Jean Arp, in abstract landscapes of Yves Tanguy, and in sculptures of Henry Moore. 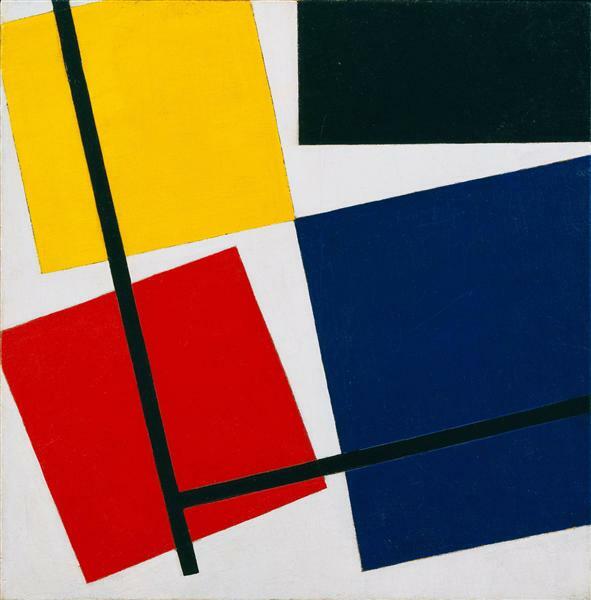 The second course was geometric (elementary) abstractions of Malevich; it used simple geometric forms (squares, circles, triangles, rhombuses), and resumed in Neoplasticism of Theo van Doesburg and Piet Mondrian, in Constructivism of Alexander Rodchenko and Lubov Popova, in Orphism of Robert and Sonia Delaunay, in Op Art of Victor Vasarely. In the middle of the 20th century, Abtract Expressionism took one more step forward, and completely abandoned all the forms. The painting focused exclusively on expressive properties of the color, used in spontaneous drips and spots on artworks of Jackson Pollock, or in huge monochrome planes of Mark Rothko. As a result, by reducing the painting to the physical presence of paint on the canvas, abstract works of these artists show us that the division between figurative and non-figurative art is merely conventional. On the one hand, no painting can be completely devoid of an object, and no painting can speak exclusively about itself; it would always refer the viewer to external reality (for example, through associations). On the other hand, any painting is abstract - after all, any image would be a result of an abstraction process, when the artist separates essential qualities of an object from omissible ones. Besides, even the most realistic painting (as well as an abstract) is just a set of color spots and lines applied to the canvas.